The last publication of the Portuguese magazine Mono (#2) edited by Miguel Carvalhais and Pedro Tudela and published by the Faculdade de Belas Artes of Porto is devoted to Writings of Music and Sound Arts. 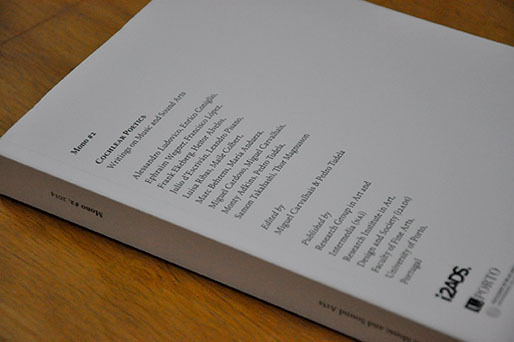 The volume contains texts by different authors, artists, composers and curators that present their ideas on the topic. As mentioned in the editorial it collects reflections on theory and practice, on composition, performance, technique, virtuosity and aesthetics, as well as on publishing strategies and other issues brought about by computational technologies. It tries to traverse a convoluted map of artistic and design practices that are developed through sound, or that intersect with sonic arts in increasingly complex ways. I am glad to contribute to Mono#2 together to the rest of the authors: Pedro Tudela, Alessandro Ludovico, Luísa Ribas, Ephraim Wegner, Thor Magnusson, Frank Ekeberg, Francisco López, Miguel Carvalhais, Miguel Cardoso, Samon Takahashi, Heitor Alvelos, Enrico Coniglio & Leandro Pisano, Julio d’Escriván & Monty Adkins, Marc Behrens and Maile Colbert. My article, A matter of displacement addresses the notion and the recognition of the different layers in the urban context connected to the listening and the soundscapes. It makes it through the analysis of the listening section of Augmented Spatiality, the event on public art and sound creation that I curated last year in Stockholm.